It was a quick turnaround on Monday after Bramham and we left for Luhmuhlen at 7.30pm on Monday evening, only 30mins later than planned. After a 19hr journey we all arrived in Germany, a little weary but in good spirits. Neuf Des Coeurs and Lionheart had an easy day for the rest of Tuesday and I took them both for a hack earlier today before this afternoons trot up, which both horses passed. I have just walked the course, which is big but mainly quite inviting. One of the most serious combinations comes early on in the course, at the main arena fence, where you have an angle to a corner followed by a corner to an angle. The lines are fairly acute here and it will take a fair bit of walking! The track follows the usual route but has had an extra loop added making the course longer - up to 11min 22sec, rather than the usual 10 min 15sec. The ground is currently quite hard and the weather is hot and dry but they will hopefully do plenty of work on it over the next few days. Neuf Des Coeurs is drawn fourth to go so will do his dressage around 9am (8am UK time) on Friday, Lionheart is much later in the draw so won't be on until Friday afternoon. Both horses will have a school tomorrow in preperation for Friday. You can keep up up to date with the results and get the full list of start times at Luhmuhlen by clicking here. 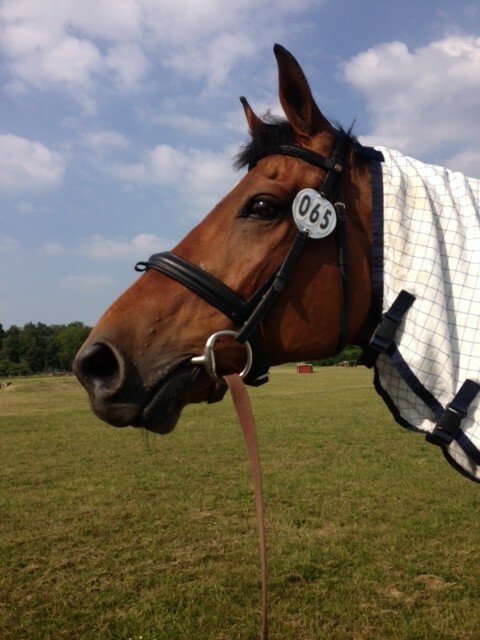 Neuf Des Coeurs (Smurf) enjoying the view in Luhmuhlen after his journey. Thank to India for sending us this!